Orvis reels are one of the best fishing reels out there. In this Orvis Hydros Reel review, we’re going to go over this excellent fly reel and we will find out the reasons why it is one of the best fly fishing reels available in the market. But before that let us see what kind of company Orvis actually is and the impact they have in the fishing industry. The Orvis company was founded by Charles F Orvis in 1856 in Manchester, Vermont. The company today, provides fly fishing equipment and claims to be the best at it. The company at its core is still a fly fishing and wing shooting company which also has some other products to go with it. All types of fishing accessories are manufactured by Orvis. In addition to fishing, the company also sells men and women sportswear, furnishing, and even travel accessories. The company operated around seventy stores and 10 warehouses in the U.S. In addition to the 18 retail stores in the U.K. The company is stable enough with two change of hands and five CEOs throughout its history. The company is privately owned by the Perkins family since the year 1865 and it is headquartered in Southwest Vermont with major operations in Virginia and the UK. It is an international brand with a multi-channel retailer. There are approximately 1700 employees in the company and the company also has an online portal to interact with the customer. The website offers a huge catalog of 5000 plus products. In addition, the company also has a 44 catalog edition with an annual distribution in the amount exceeding 45 million. Orvis also has its own blog which contains a lot of educational material. The blog can serve a lot of new and pro anglers worldwide. Orvis has always claimed that their hydros reel is their next big reel in the market. There was much speculation about Orvis’ new reel. When it came out, most people were looking forward to buying it and they were pretty right with their decisions because the Orvis Hydros SL is arguably one of the best-designed fly reels available in today’s market. The enthusiasm is there because of many reasons. The first being the sizes, the reel can be bought in any size by any type of anglers. In addition, the reel has a machined bar stock aluminum build with a great design that will impress most of the people who get this reel. The build material of the reel is aluminum which provides a sturdy feel to it. therefore, the reel will last you longer. The drag system that you get with the reel is a fully sealed carbon which is on a stainless disc. The Spool Design is probably the best thing about the Orvis Hydros SL. There is no doubt that this spool will give you full satisfaction. The drag system is also one of the best out there. On the drawback side of things, there are plenty of high-end features missing which really begs the question of its pricing. Although, the drag knob isn’t the best. Despite that, the reel does do well with a really smooth drag. The Orvis Clearwater reel has an aluminum arbor of large size and it is light enough to go with your rod. The reel is perfect if you’re on a budget. 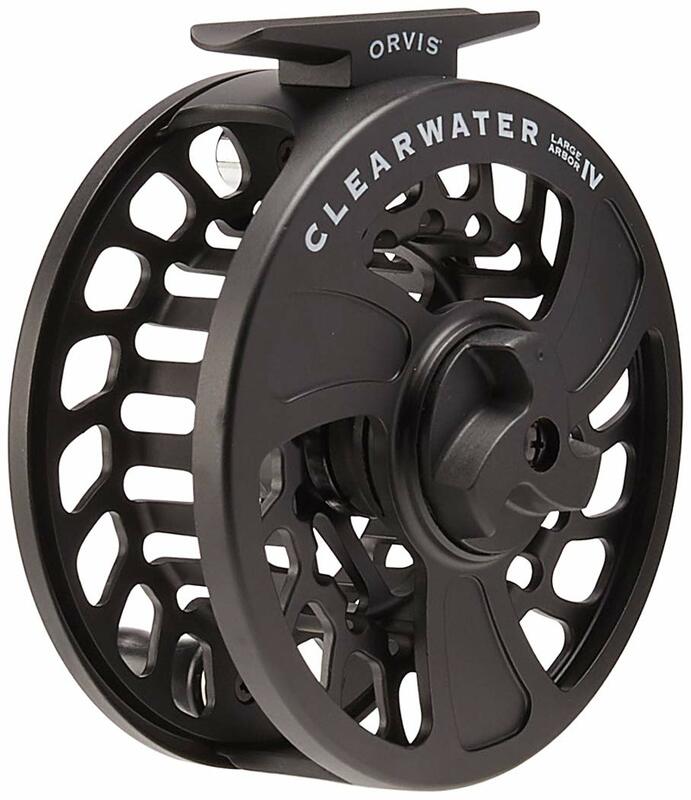 Despite being affordable, the clearwater large arbor reel can be as useful as a machined reel and the retrieve makes it a solid buy for you. The Orvis Clearwater reel can be an extremely useful buy for new anglers and people with a fair bit of experience of fishing. For an expert angler, we recommend to look elsewhere, you may find the reel too slow to get the required distance. We understand that it can be pretty difficult for pros to work with it. The Orvis Battenkill has a mid arbor design which is really better than the Hydros SL. The finish is ported jewel and surprisingly, it has an affordable price. The performance that the reel gives is impressive as well. The downside is that the reel can be a bit heavy for some and the color palette can be a deal breaker here. The 6061 T6 Aluminium build makes the Orvis Mirage one of the best build reels out there. The reel has a stainless steel disc which is sealed. The performance here is pretty hefty. The default drag setting is perfect for a beginner. The one downside here is its weight and the drag adjustability which we found to be a bit off. In addition, we found the spool to be to narrow. This can be problematic for many. Orvis is one of the best companies in the fishing industry, no doubt about it. The company has served multiple generations and is still going strong. They believe in changing with the time and that has kept them in business for decades. The Orvis Hydros SL is a really impressive fishing reel. It stacks up pretty well with the competition in the same price bracket. The drag system and the spool design make it one of the most wanted products in the Orvis’ catalog. In comparison with some other reels like Orvis Clearwater, Mirage, and Battenkill, the Hydros SL is slightly better. But the drawbacks that the hydros SL has, aren’t present in the other reels mentioned above and vice versa. To be fair, all of the reels have their own strength and weakness. At the end of the day, it depends on what you’re looking for. All these products by Orvis will undoubtedly help you in the wrong run though.